About a month ago I tweeted with 100% sincerity, “I zone out as soon as a TV show description uses the words, ‘crime boss.’” Although in my tweet I was referring to a synopsis I had seen on Netflix, believe me when I say this is true for books as well. I have no capacity for paying attention to a story where macho men brandish guns while calling women “broads” or where the word “capeesh” is used as a replacement for a question mark. I am not so arrogant to think that just because these stories don’t appeal to me, it means they’re bad, but nevertheless, whenever I say I don’t like this genre someone usually mentions The Godfather or something similar as if I’ve been living under the biggest and most soundproof rock in creation. “BUT WHAT ABOUT THE GODFATHER?” “I’ve seen it!” “But did you like it?” “No!” Anyway, one week after my tweet (and its now obvious foreshadowing), I was cracking open Jennifer Egan’s newest novel, Manhattan Beach, to find the story centered around what can best described as… sigh… a crime boss. Or, more accurately, a woman whose life is deeply affected by a crime boss. I broke out into a cold sweat as I became increasingly aware of what I was getting myself into. I’d already planned to write a review of Egan’s new book because two of her previous novels,The Keep and A Visit From the Goon Squad, are some of my personal favorites. I didn’t feel like I could back out now. Besides, what would I write about if not this? Time was of the essence and, frankly, I hadn’t expected Jennifer Egan to do this to me. Despite my trepidation, I took the plunge and read it… and as much as I hate to admit when I’m wrong, I guess I like crime fiction now. Manhattan Beach is a historical novel which begins at the seaside in Brooklyn ten years before the start of WWII. Here we meet the book’s main character, Anna, as a young girl whose father has taken her on a business trip to meet up with a man we later learn is a racketeer, Dexter Styles. The reader quickly recognizes that Styles will be an important person but Anna is the character around which the story revolves. We watch her grow from a young girl with a special closeness to her father and disabled sister, to a woman whose relationships become more complicated as time passes (as relationships often do). A little later in the book Eddie, Anna’s father, disappears, leaving the reader and Anna to presume he’s dead after involving himself with Styles and other nefarious characters. We won’t find out what happens to Eddie (or how it happens) until the end, but getting there is captivating as Egan has each of the main characters crossing paths in present day and in flashbacks. As we discuss main characters, I would be remiss not to mention the sea itself, where this novel begins and ends. No, crime bosses and mob stories are not my normal thing, but I am a sucker for tales set in New York City, and I love a good World War II backdrop as well. Combine these with a seascape description so palpable I could feel, smell, and hear it. Suspending my disbelief came easily. Even locations and situations which would normally cause me to zone out (back rooms of nightclubs with a lot of cigar smoke, poker dens, the repetitive use of the word “boss” which I can only hear in a thick Joe Pesci accent) rolled right off of me and, in some cases, lured me in. Egan crafts this backdrop of the beach and the sea masterfully. The ocean is always there; she has built this dreamy, foggy world so well. It cleanses, it blinds, it maims, it baptizes. The book, of course, is not without its flaws, and I did not feel compelled to shout from the rooftops my admiration for it as I did with Goon Squad and The Keep. It is plot-driven almost to a fault, leaving something to be desired when it comes to the intricacies of characters’ relationships. At 433 pages, Egan does not rush her story. In fact, at times, I wished for fewer details about ship repair and more about the inner workings of the characters and their thoughts. 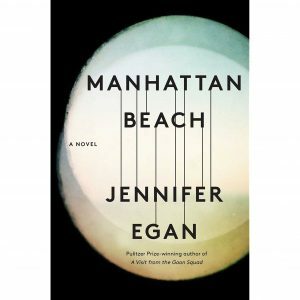 But overall Manhattan Beach succeeds, and Jennifer Egan has proven herself to be a writer who will not be pigeonholed as someone who only writes a specific genre. And, thus, she has made this reader branch out into other genres as well, which can only be a good thing. Capeesh?